Beach Retreat is a chalet-style beach house, a comfortable and cosy place to unwind. All-round views of seaside and countryside. Relax in a deckchair on the raised decking or in the private beach garden; stroll along the beach to Whitstable with its boutiques, restaurants and busy fishing harbour. Ideal for walkers and birdwatchers, with the Saxon Shore Way and Oare Marshes Reserve close by. The cathedral city of Canterbury is just a short drive away. I love to escape the bustle of everyday life and spend time by the sea. I live just a few miles from Beach Retreat so I'm always on hand to offer my guests any assistance they need or provide local information! For direct bookings please email me, beachretreat@btinternet.com. Beach Retreat is my dream house by the sea which I bought a few years ago. It's my pleasure to make it available to my guests, many of them regulars, who love this spot as much as I do. All rental income has been put into improving the property, most recently with a beautiful new kitchen area. Beach Retreat is remote and peaceful, yet not isolated. Convenient shops in the village of Seasalter are within walking distance; Whitstable with its working harbour, boutique shops and restaurants is 5 minutes drive, or a pleasant 45 minute walk around the bay. Birdwatchers need hardly leave the house, just wait for the seabirds to arrive at low tide! But Swale Nature Reserve is just down the beach, and Oare Marshes Reserve, with trails and hides for birdwatchers, is a few miles away near Faversham. For a unique local gourmet experience, try The Sportsman down the road - but you will need to book in advance! Bathroom with shower, handbasin, wc. Parking for 2 vehicles on the forecourt. Living area has sofa, armchairs, coffee table. Dining area has table and four chairs. TV with DVD and CD player, easily moved for viewing from any area. Electric fan oven, 4-ring gas hob, microwave. Fridge with freezer compartment. Dishwasher. Electric kettle, toaster. Whitstable Golf course, just a few minutes drive away. Notes on accommodation: Please note: Pets are not accepted. No smoking. Outside: Outside decking with dining table and chairs and deckchairs available. Beach garden with camp-fire / barbecue area. Direct access to the sea. Cleaning / Towels / Linen / Maid service: Bedlinen and towels are provided. Cleaning and linen change at end of let or once weekly for longer lets. More frequent cleaning and linen change is available on request. Laundry service available on request. Peaceful area. Very nice to get away. We had a very pleasant two day break in the chalet, watching the ever-changing sea and bird life. The accommodation is well equipped and comfortable. We particularly appreciated the binoculars provided. We will definitely stay again. So glad you enjoyed! I look forward to welcoming you back to Beach Retreat. The beach hut was lovely, perfect location, peaceful and the hut was in perfect condition and had everything we needed. You can walk along the beach and walkway to Whitstable within an hour and we also cycled all the way to Margate. Hope to be back again to a lovely property and beautiful part of the country. What a stunning jewel of a beach retreat. Spotlessly clean with everything you need. Beautifully decorated and furnished and a real cosy and relaxing holiday. We de-stressed completely and thoroughly enjoyed our stay. Given the chance, we will most definitely be back. Thank you Melinda for a wonderful break. 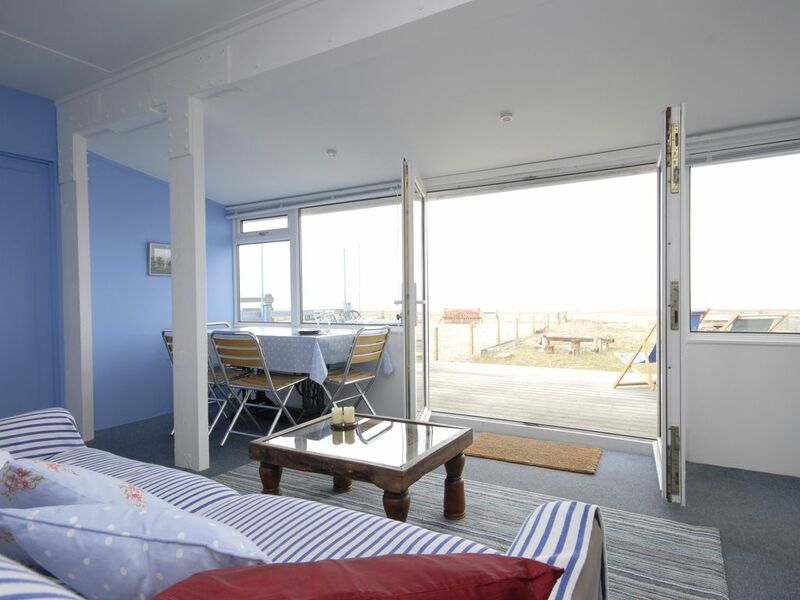 Beach Retreat is located right on Seasalter Beach, with its own private beach garden and direct access to the sea. The beach is mostly shingle with some areas of sand. A pleasant 45 minute walk along the beach brings you to Whitstable, or in the other direction, Swale Nature Reserve and the Saxon Shore Way footpath are 20 minutes' walk away. Gatwick Airport 90 minutes, Heathrow 120 minutes driving. London City Airport 1 hour by train. Manston Airport 20 minutes driving (flights from Schipol Airport, Holland). Dover 60 minutes driving. Nearest rail stations Whitstable or Faversham. Use of car is recommended, but not essential - shops in Seasalter within walking distance; buses from Seasalter to Whitstable and Canterbury. Cycle hire available from Whitstable. Booking Notes: Booking is possible by email, telephone or post. Payment by cheque or bank transfer. Changeover Day: Flexible changeover day; short lets available, minimum 2 nights. Arrival by 3 p.m. and departure by 11 a.m., but later departure is usually possible on request. Notes on prices: Short lets, minimum 2 nights: £145 per night. Contact me for discounts on stays of 5 - 6 days. £100 refundable "good housekeeping" deposit.